The UK government needs to be "less deferential" towards the US and more willing to say no to Washington, a group of MPs have said. The Commons Foreign Affairs committee also said it was wrong to speak of "the special relationship" with the US, as it was fostering other alliances. However, the MPs did agree that the link between the countries was "profound and valuable". The Foreign Office said the two nations share a "unique" bond. 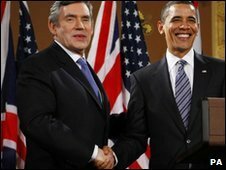 The committee said the phrase "the special relationship" did not reflect the "modern" Anglo-American relationship. It was originally coined more than 60 years ago by Winston Churchill. The committee said although Britain and the US still had close ties, the UK's influence had "diminished" as its economic and military power had waned. "The use of the phrase 'the special relationship' in its historical sense, to describe the totality of the ever-evolving UK-US relationship, is potentially misleading, and we recommend that its use should be avoided," the committee said. "The overuse of the phrase by some politicians and many in the media serves simultaneously to de-value its meaning and to raise unrealistic expectations about the benefits the relationship can deliver to the UK." Three Labour MPs and two Conservatives voted unsuccessfully for the recommendation to be dropped but were over-ruled. The committee said that the relationship was more associated now with the perceived support Britain gave to President George W Bush over the Iraq war. Foreign Affairs Committee evidence session on the "special relationship"
"The perception that the British government was a subservient 'poodle' to the US administration leading up to the period of the invasion of Iraq and its aftermath is widespread both among the British public and overseas," it said. "This perception, whatever its relation to reality, is deeply damaging to the reputation and interests of the UK." The committee also said US President Barack Obama had taken the same "pragmatic" attitude as it was recommending now since entering the White House in 2009. It said: "The UK needs to be less deferential and more willing to say no to the US on those issues where the two countries' interests and values diverge. "The UK's relationship should be principally driven by the UK's national interests within individual policy areas. It needs to be characterised by a hard-headed political approach to the relationship and a realistic sense of the UK's limits." Committee chairman Mike Gapes said: "We must be realistic and accept that globalisation, structural changes and shifts in geopolitical power will inevitably affect the UK-US relationship. "Over the longer-term, the UK is unlikely to be able to influence the US to the extent it has in the past." A Foreign Office spokeswoman said the British media's "preoccupation" with the state of the relationship was often at the "expense of coverage of the more substantive aspects of the relationship". "It doesn't really matter whether someone calls it 'the special relationship' or not," she said. "What matters is that the UK's relationship with the US is unique, and uniquely important to protecting our national security and promoting our national interest." Sir Winston had first coined the phrase during his famous "Iron Curtain" speech in March 1946. He had been inspired by the countries' shared struggle against Nazi Germany and the Soviet Union. And throughout the Cold War, cultural and historical similarities, diplomatic consultation and defence and nuclear co-operation meant that Anglo-American relations were particularly close.